Marble Jelly Mrs T Morley Clean pigs feet and ears with the greatest nicety boil them in a small quantity of water till every bone can be taken out put plenty of [singes?] parsley chopped very small a little white pepper salt & mace finely powdered simmer till the herbs are scalded then turn it into a melon mould. Ramakins with Potatoes [Do?] Half a pound of potatoes beaten fine a quarter of a pound of cheese scraped fine 3 ounces of fresh Butter. 3 Eggs & a little cream, add pepper & salt mix it well together make it quite hot in the dish you serve it up in, and Brown it with a salamander. Paste for Tarts [Do?] 6 oz of flour & 4 oz of Butter, two tarts cut the Butter quite small in the flower mix with a very little water to be baked in a quick over. 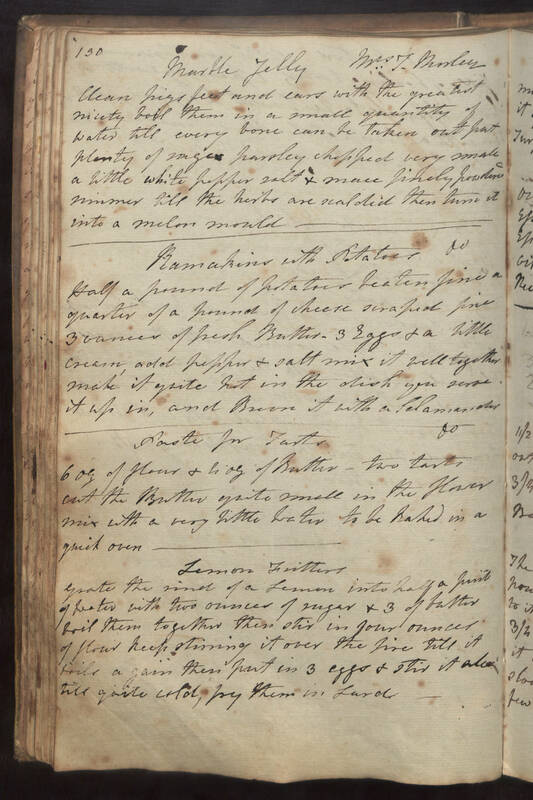 Lemon Fritters Grate the rind of a lemon into half a pint of water with two ounces of sugar & 3 of butter boil them together then stir in four ounces of flour keep stirring it over the fire till it boils again then put in 3 eggs & stir it [illegible] till quite cold, fry them in lard.